Well, it became official Monday. Auburn didn't get an invite to the NCAA Postseason. Was is Surprising? Not really. The biggest surprise? Probably Baylor and Oklahoma State. 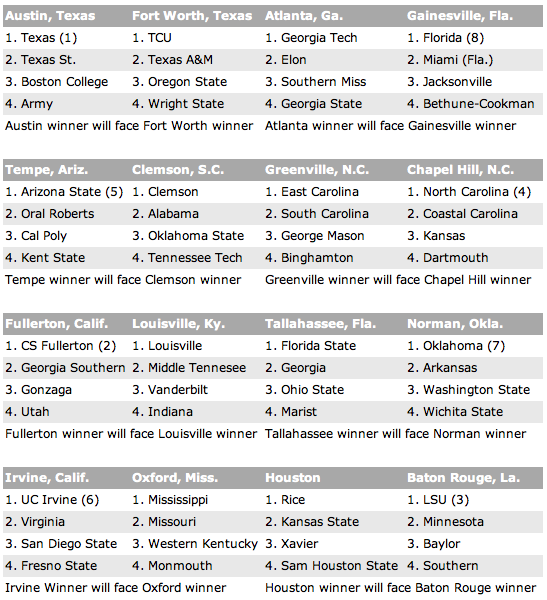 That inclusion (and the exclusion of Rhode Island and Dallas Baptist) seems to have most CB Sportswriters up in arms. The strangest two inclusions were both from the Big 12 -- Oklahoma State and Baylor. The Cowboys posted a gaudy RPI, but won just two of nine conference series and failed to qualify for the Big 12 tournament. This is the sixth time that a team made the big dance while finishing outside the top eight in its conference; the other instances all involved the SEC, and none of these teams advanced to the super regionals. Note the bolded Text. It's one thing for an SEC school to be included, and not make the conference tournament. There are 12 Teams in SEC Baseball. So you have 4 teams who don't make it to Hoover. In the Big XII (baseball at least) there are only 10 teams (Iowa St. is a club team/Colorado doesn't play). Meaning if you don't make their Conference tournament, you are one of the bottom 2 teams in the league. Texas Tech probably has a bigger gripe than Auburn does. At least they made their conference postseason (yet were excluded from the NCAA). For those Auburn fans who like to see Alabama suffer, Monday gave a little vindication. Taking 2 of 3 from the Tide cost them a Regional Host slot, and forced them to go to Clemson. So yeah, there's that. Also, It's not necessarily a bad thing Auburn didn't make the NCAA tournament without going to Hoover. Tom Slater did that same thing in Hoover (and it probably bought him an extra year, and some unneeded apathy). It sets a precedent. Go to Hoover, then think about the NCAA. Hoover first and foremost. At least the 2010 Tigers can look back and be even hungrier for Hoover. Knowing that without that stop on I-65, the Road to Omaha ends quickly. It's maddening really. For baseball, the NCAA has this weird, "Oh we'll stick 3 or 4 close (geographically, teams together) and then screw out some Northern School". The NCAA, worried about Money/Fans/Travel/etc, did a pretty head scratching job grouping these schools together and finding ones close to each other. Who did Virginia piss off? The 'Hoos win the ACC Tournament and their reward? Fly across the country to face UC Irvine in the Toughest Regional. You get to travel farther than any other school (Though Georgia Southern has an equal beef, being a #2 Seed but getting shoved to Fullerton, CA). Oh and Georgia State says "Thank You". Their trip to the Regional? All of 2 miles in Downtown Atlanta. Going a combined 12-16 against the field. With the small losses out of this year's team and the potential (perhaps I should italicize that) for big things out of the next recruiting class, I think we're headed in the right direction. Honestly, after that first Elon series, I'm happy with Pawlowski's job getting this team to where it wound up. At WORST, we were the same under Slater.